The quaint little town of Waubra is only 105 km (70 minutes drive) from our place, so we decided to take Pam (Kim’s mum) for a tourist trip. 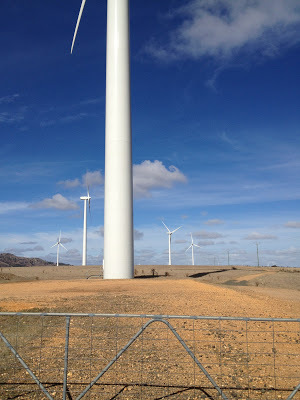 It sports a very large wind farm, which I believe is the fourth largest in Australia. It is such a pleasant country journey which I really enjoy. 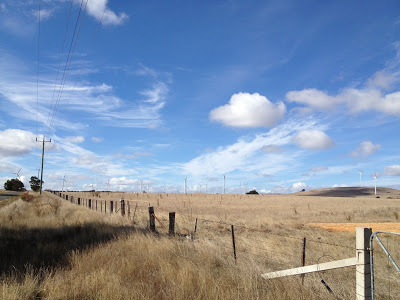 I have written about our first visit to Waubra in this post titled “Waubra Wind Farm“, and also busted some wind farm myths in this post titled “Busting Myths About Wind Turbines“. I am indeed a fan of this type of renewable energy (pun intended)! Anyway, here are a few photos from our trip. I have also posted a video on The Greening of Gavin Facebook page which shows how quiet these things really are. We were only 200 metres from one turbine, and could hardly hear it. The wind itself, was louder. The view on the way out of town. So picturesque. We pulled up at our favourite turbine for a thermos of coffee that I prepared before leaving home. It was a welcome break under a very large turbine. 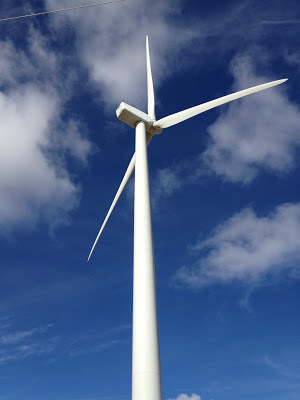 This is the turbine we took the video footage of. The rolling hills covered in turbines, looking to the east. A magnificent site for a cup of coffee. The man with his fan, or is that he is a big fan? 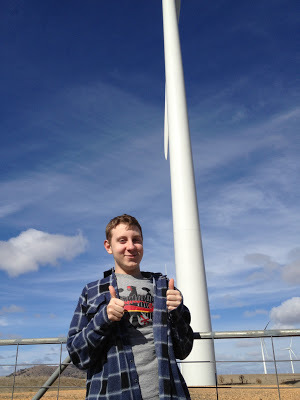 Ben gives the Waubra Wind Farm a double thumbs up! He really enjoyed himself, which was part of his science lesson for the day. Although Pam and Kim were not in any of these photos, they were actually there with us. Both of them could not stop talking of the majesty of the wind turbines, and how spectacular they look. 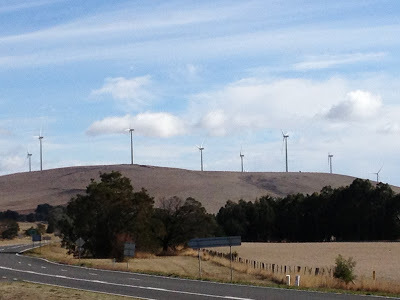 When I told Pam that these turbines provide most of the electricity for Ballarat, she was simply amazed. We enjoyed our day out. Wind farms are cool! What do all these things have in common? Well not much normally, but in my week of fun, quite a lot! My Dad and his partner Norma, and Kim’s mum, Pam have been visiting over the last few weeks. I have been spending time away from the blog and the internet in general to spend time with them all. Meal times have been quite hectic, but otherwise, very enjoyable and relaxing time has been had by all. I have also been on annual leave since 25th April, and go back to work on 2nd May. So we really have had a full house, but getting lots done. Kim and I have also made a very difficult decision that took us two days to finalise, however I cannot share it just yet. Anyway, heaps of work in the veggie patch. Brown onions, garlic, Red onions, Red cabbage, Sugarloaf cabbage, Raddishes, Carrots, Snow Peas, and Broad Beans all planted in the main garden beds. 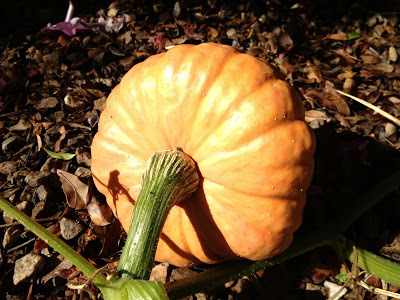 The last of the Australian Butter pumpkins have been harvested, and some of the vines composted. 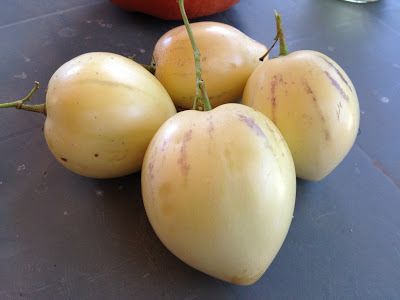 The Pepino bush has been very productive as well. Here are just four of about twenty fruit that are still on the vine. Now a tip for Pepinos if you are going to harvest them. Wait until they are this colour (custard), but make sure the purple lines have not faded. With these lines bright it mean that it will taste like a cross between a banana and a rockmelon (cantaloupe). If the purple lines have faded, the fruit tastes like old school cough medicine. So keep an eye on them as they turn from green to custard colour and you will be right as rain. 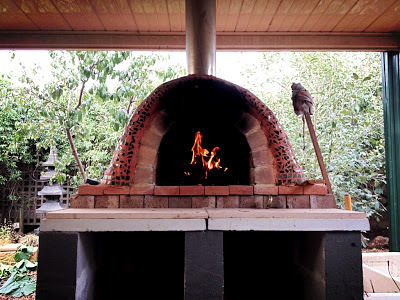 The clay oven got a workout on ANZAC Day (25th April). Dad and I headed up the oven for 3 hours, with our efforts lubricated with a few bottles of home brewed Fat Yak. A very relaxing afternoon, with lots of catching up and laughter. Between us, the chooks, and the two dogs, we had a wow of a time. Oh, the pizza and calzone was good as well! Friday, Dad and I made five soap mould boxes. I nearly took out my belly with a few bits of flying wood, but all good now! Oh what fun it was to get back into woodwork again. 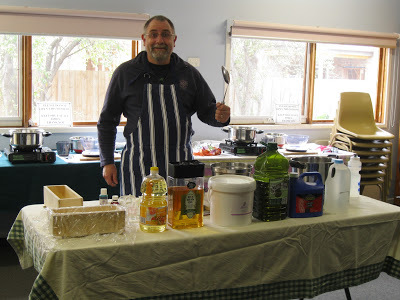 Today, Kim and I taught a soap making workshop to four lovely ladies at the Melton South Community House. You can see that I was raring to go just before everyone arrived. My demo table was at the front, with the two workstations set up at the back. Four in the class was just right. Here are two of the ladies being instructed by yours truly. I teach all the science stuff, and Kim demonstrates how to cut and mature the soap near the end of the lesson. We had a ball, as we always do. Pam joined us for the fun and games as well. Dad and Norma depart for South Australia to catch up with family tomorrow. It will be sad to see them go. However, the week doesn’t stop there. 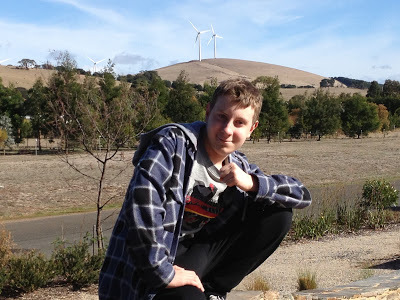 Tomorrow we are driving up to Waubra to have a picnic under the wind turbines. Pam has never been up close and personal with a wind turbine, so it will be a treat for her. 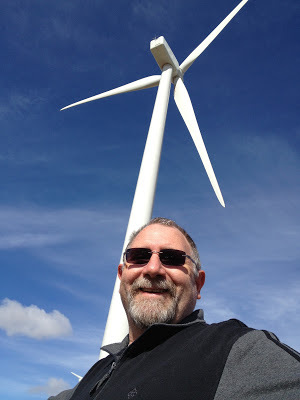 For me, I just love the countryside, and the wonder of renewable energy (and the food of course). Pam departs on Tuesday night, which will make Kim sad, but I am here to cheer her up. 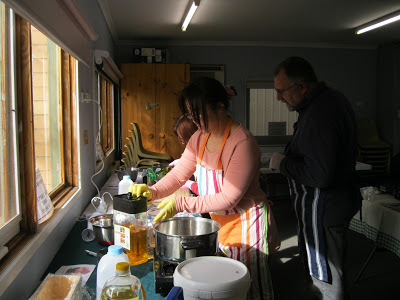 Finally, on Wednesday, we have a Mozzarella course being held at Roxborough Park Homestead. Eight students and lots of fun. I did miss blogging, but after all these years, I do know when to take a step back when family is around. Everything in balance. 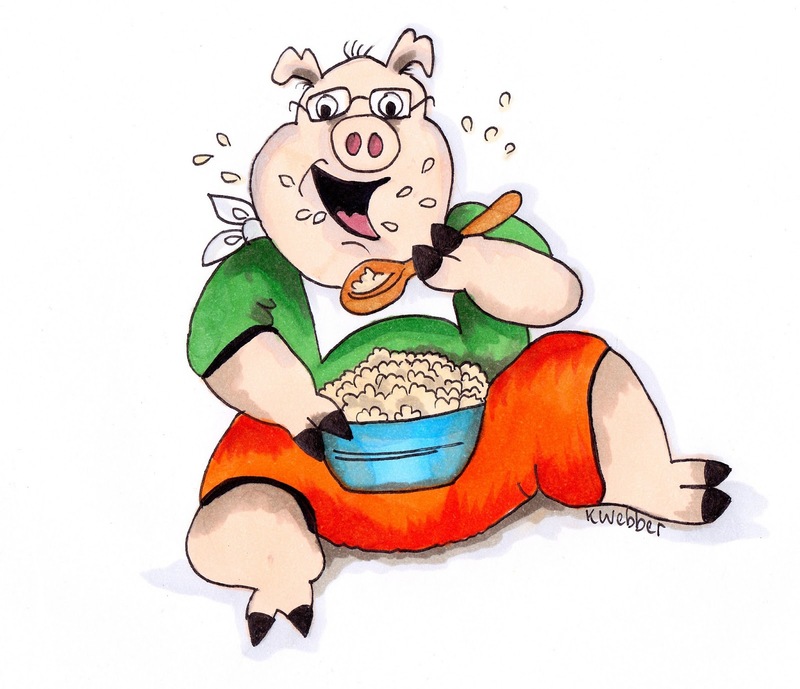 Oh, and my latest eBook “Keep Calm and Make Cheese” has been well received. Over 50 copies sold in less than a week on this site, and various retailers. I also implemented a shopping cart system on the eBookstore so that I don’t have to manually send the PDF files anymore. I didn’t think the customer experience was satisfactory, so I made the change. It is all automated now, with the eBook file delivered to the customer by the shopping cart system. I am quite happy with the end result, and the cheese book was a pleasure to write, although the research was a challenge at times. 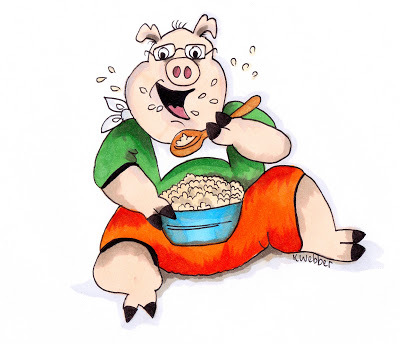 I love the brilliant illustrations by Kim! They are like icing on a cake. So dear reader, what cool sustainable living things have you been up to lately? I was looking for a pertinent post for today, following on from Earth Day yesterday. I kept stumbling across this old post of mine, so it was destined to be posted again! I wrote it way back in the first year of this blog, but it is still just as relevant today, if not more so, see that we have still done little to preserve the Earth. I got the thread of this idea from a permablitz newsletter, and have expanded on it somewhat. Just go with the flow, and no plagiarism is intended. Terraforming (literally, “Earth-shaping”) of a planet, moon, or other body is the hypothetical process of deliberately modifying its atmosphere, temperature, surface topography or ecology to be similar to those of Earth to make it habitable by humans. Not quite possible yet, however many sci-fi books have been written about the subject. Also quite a few Star Trek episodes have covered off the process of terraforming (Search for Spock comes to mind on planet Genesis). You may think that terraforming is out there in sci-fi land, but have a think about it. On a global scale we are reverse-terraforming our one and only planet, as I write this post. I think that this is all very strange that humanity is trying is darndest to stuff up this planet and making it uninhabitable to humans. 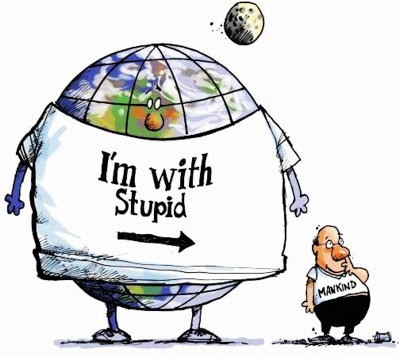 Ever increasing volumes of greenhouse gasses being pumped into the atmosphere, the polluting of our oceans and decimation of fish species by overfishing, the mass extinction of nearly every mammal on the planet (except our own), and overpopulation by humans. All of these events have begun to erode the habitat for the very species who began the process. That would be you and I for those who haven’t figured it out yet! So here is a question to all of you. Do you think we can begin to terraform our own planet back into a habitable environment? Well, famous sci-fi author Kim Stanley Robinson, of the Red Mars, Blue Mars, Green Mars trilogy, says we should start thinking about terraforming planet Earth. He says that permaculture is a way to terraform for the better. “It would be really good if ecological and permaculture principles were taught in schools as a basic part of the science curriculum and one’s general education. I think to an extent this is happening, it’s getting more common to learn ecology and earth sciences by studying where your food and water come from, and the energy and carbon and water cycles, and so on. These educational basics are needed to make sense of the oncoming problems of this century. It would help also if this education led to a more realistic economics, in which there wasn’t so much false pricing based on theft from the future generations. This would take legislation and run into opposition from “free enterprise” (read free to steal from the future). You can read the full interview with Kim Stanley Robinson here. I also believe that by learning the principles of permaculture we can change the way we look at the environment around us. So instead of dreaming of changing distant planets to become the new haven for humans, why don’t we focus on saving our existing planet and learn as much as we can about living on the land sustainably. This is the very essence of permaculture, creating a sustainable place to live, that can feed and nurture its inhabitants. What are you waiting for? Lets get to it. We certainly don’t need Khan or the Genesis device to start this big bang!